← It’s snowing; it must be Wednesday! IMG_3939, originally uploaded by leyaevelyn. 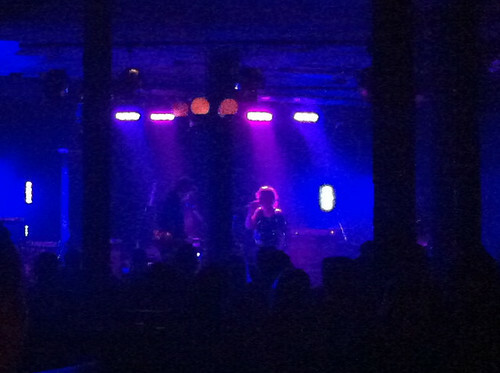 Last Saturday evening I went to see Jenn Grant sing with her new group, Aqua Alta, at the Marquee Ballroom in Halifax. I haven’t been going out much at night lately. Partly the weather–cold/ice/snow–partly because I feel I’m on a roll with my painting and want to focus my energy for my work. Nevertheless, it was wonderful to get out, hang out with friends for the evening, hear the beautiful Jenn sing. Her voice is so clear, like a bell, a real pleasure. Of course, the next morning I was back in my studio, early. I feel like a kid in a candy shop when I am there. So many delicious choices. Some days I am so impressed with a painting, only to come back the next day and think it is awful. But overall, it’s going well. I’ll be needing new supplies soon. About thirty years ago, I moved from New York City to rural Nova Scotia. For an artist, it is a good place to live. Spacious and quiet. Despite the beautiful scenery and frequently grey skies, my abstract paintings focus on color, its expressive qualities and how it creates form and space. This entry was posted in Art, Music and tagged Arts and Entertainment, Music, Painting. Bookmark the permalink.